Before 1870, electricity generation was carried out on a small scale. After its discovery in 1930 by Michael Faraday, electricity was produced using only chemical reactions or battery cells. The amounts of electricity produced were quite small and only found practical use in the Telegraph. However, its potentials were very well recognized and ways to increase production were studied. By 1870, commercial electricity production was achieved by the coupling of the dynamo and the hydraulic turbine. That same year, this achievement birthed the second industrial revolution. Since then, electricity production has grown to become a full-blown industry, involving plants and several different sources of electricity generation. Sources of electricity generation are broadly categorised into three; fossil fuels, nuclear energy, and renewable energy. Fossil fuels such as natural gas, coal, and petroleum are used as energy sources through combustion. The heat generated is converted to mechanical energy and then to electrical power using steam or gas turbines. These sources of energy negatively impact the environment through carbon emissions. Similar to fossil fuels, nuclear energy generates heat which is converted to electricity by steam turbines. The heat is generated by nuclear fission in radioactive elements. Renewable energy sources are the cleanest and safest sources of electricity generation. These sources are available in nature and as the elements. Renewable energy sources include solar energy, wind energy, biomass, hydropower, geothermal power, etc. Of all these three take the lead in availability, reliability, and usability. Among renewable energy sources, they are of most interest to both researchers and investors alike. They are Hydropower, wind energy, and solar energy. These sources are similar in the fact that they are all from the elements. 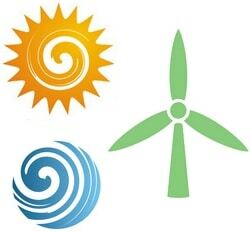 Hydropower, wind energy, and solar energy are gotten from water, wind and the sun respectively. In this article, we would be analysing these elements, their respective energies, and their electricity generation capabilities. Hydropower refers to the power of fast-running water or water falling under the influence of gravity. 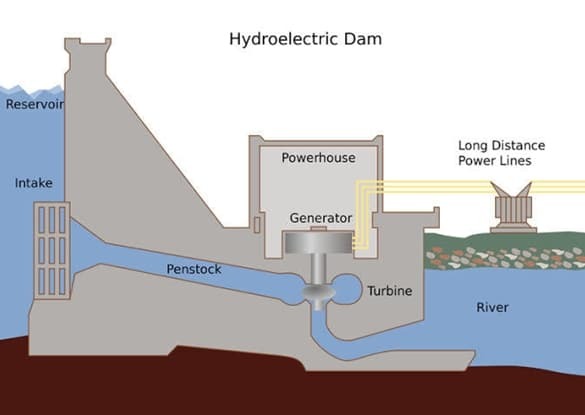 To generate electricity, water is caused to flow through a turbine that is connected to a generator by a shaft. Rotary motion is created by water flowing over the turbine blades. Through the shaft, this mechanical energy is then transmitted to and converted by an electromechanical generator, thereby generating what is known as hydroelectricity. Hydropower can be harnessed for electricity generation in the following forms and stations. Dams – potential energy of dammed water turns in the turbine. Run-of-the-river – These hydro stations use the kinetic energy of running water. Tide- Tidal power stations generate electricity using the rise and fall of ocean water resulting from tides. Hydropower generates 24% of all electricity and 71% of renewable electricity worldwide. Hydropower provides a flexible means of electricity generation. Hydropower stations can be very quickly adapted to changing energy demands. The maximum and minimum generation periods of hydropower generation correspond with seasonal changes which affect water bodies. Fluctuations in hydropower are therefore predictable and can be compensated for. Hydropower produces low cost to high-value power. Although the cost of hydroelectricity varies with generating station capacity, it is relatively cheap. Hydropower stations are capable of generating substantial amounts of electricity for both public and industrial purpose. The Infrastructure needed to produce large amounts of electricity from hydropower is cost intensive. Certain infrastructure such as dams can cause environmental damage through loss of land. Hydropower comes with location restraints as stations need to be built into water bodies. Most times, the water used contains particles and sediments. These can damage equipment as they flow over them. Wind energy refers to the kinetic energy of moving air. This energy is used for electricity generation using a wind turbine. Also known as wind energy converters, wind turbines convert the kinetic energy of wind into electrical energy. As air flows through a wind turbine, its blades rotate, creating mechanical energy. This energy is transmitted using a shaft, to a gearbox and then Ronan electro-mechanical generator. 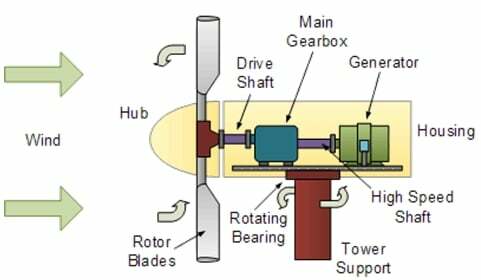 The gearbox controls the speed of the rotary motion, while the generator converts it to electrical energy. For large scale electricity production, wind farms are created. A wind farm consists of several wind turbines which are connected to a transmission network. Currently, wind power is capable of generating 600GW worldwide. This accounts for 6% of the world’s energy demand. The processes involved in harnessing wind power have very little impact on the environment. For high-capacity wind farms, the cost of electricity generated is cheap. Wind turbines require a relatively small amount of space. Even when there are several turbines making up a wind farm, sufficient ground space is left for other purposes. The cost of harnessing wind power for private use is not very practical. Wind conditions fluctuate very unpredictably and frequently. This makes it difficult to predict energy fluctuations. Wind turbines have to be installed at good wind sites. This creates restrictions for their use. Sunlight reaching the earth possesses a form of energy known as solar energy. 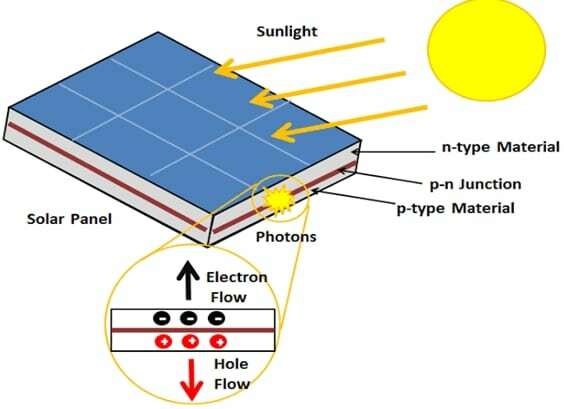 Through what is known as the photovoltaic effect, this energy can be converted to electrical energy. The photovoltaic effect happens when sunlight absorbed by certain materials causes the excitation of its electrons to a higher energy state. This creates electric current and voltage in the material as it is exposed to light. Solar energy is converted to electricity using a device known as a photovoltaic module production solar panel which typically consists of photovoltaic solar cells. Most solar panels have a conversion efficiency of 30%. Currently, solar energy accounts for 2.3% of electricity supply worldwide. This percentage is growing at 35% per annum. The cost per KWh of solar electricity varies by the scale of production. Solar energy is a very good source of private electricity generation. Fluctuations of solar energy are predictable and can be compensated for. Solar irradiance is high during the day and low at night. This also goes for summer and winter. Since solar panels have no moving parts, they require very little maintenance. Large scale solar electricity generation requires a lot of space in order to contain the required number of panels. Although day and night energy fluctuations are known, solar energy fluctuates with the weather. The use of renewable energy sources continues to rise. Not only are the self-replenishing, but they also provide clean energy. Having analysed all three foremost renewable energy sources, which would you crown the ultimate in electricity generation? or copy this trackback: http://engineering.electrical-equipment.org/power-quality/power-generation-which-element-is-the-ultimate-one-wind-water-or-sun.html/trackback from your own site.